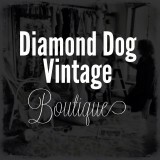 Diamond Dog Vintage – High quality vintage without the high price tag. An emphasis on Australian vintage labels and sources all her stock from regional Victoria and its surrounds. Open most days of the week, Sally is happy to organise private viewings by appointment, or just drop by for a browse and a chat.